If you have any questions about identity theft and your taxes, don’t hesitate to call the office for assistance. Use the standard mileage deduction in 2016 and simply multiply 54 cents by the number of business miles traveled during the year. Your actual parking fees and tolls are deducted separately under this method. Keep careful records of your travel expenses and record your mileage in a logbook. If you don’t know the number of miles driven and the total amount you spent on the car, your tax advisor won’t be able to determine which of the two options is more advantageous for you at tax time. Furthermore, the tax law requires that you keep travel expense records and that you show business versus personal use on your tax return. If you use the actual cost method for your auto deductions, you must keep receipts. Call today and find out which deduction method is best for your business-use car. Many small business owners ignore tax planning. They don’t even think about their taxes until it’s time to meet with their CPAs, EAs, or tax advisors but tax planning is an ongoing process and good tax advice is a valuable commodity. It is to your benefit to review your income and expenses monthly and meet with your CPA, EA, or tax advisor quarterly to analyze how you can take full advantage of the provisions, credits, and deductions that are legally available to you. If you’re ready to meet with a tax professional to discuss tax planning strategies for your business, call the office today. Partnerships do not pay income taxes. Rather, the income and expenses (including deductions for charitable contributions) are passed on to the partners on each partner’s individual Schedule K-1. If the partnership makes a charitable contribution, then each partner takes a percentage share of the deduction on his or her personal tax return. For example, if the partnership has four equal partners and donates a total of $2,000 to a qualified charitable organization in 2016, each partner can claim a $500 charitable deductions on his or her 2016 tax return. Note: A donation of cash or property reduces the value of the partnership. For example, if a partnership donates office equipment to a qualified charity, the office equipment is no longer owned by the partnership and the total value of the partnership is reduced. Therefore, each partner’s share of the total value of the partnership is reduced accordingly. Ask for–and make sure you receive–a letter from any organizations stating that said organization received a contribution from your business. You should also keep canceled checks, bank and credit card statements, and payroll deduction records as proof or your donation. Further, the IRS requires proof of payment and an acknowledgement letter for donations of $250 or more. Now is a great time to clean out that growing mountain of financial papers and tax documents that clutter your home and office. Here’s what you need to keep and what you can throw out. Let’s start with your “safety zone,” the IRS statute of limitations. This limits the number of years during which the IRS can audit your tax returns. Once that period has expired, the IRS is legally prohibited from even asking you questions about those returns. The concept behind it is that after a period of years, records are lost or misplaced, and memory isn’t as accurate as we would hope. There’s a need for finality. Once the statute of limitations has expired, the IRS can’t go after you for additional taxes, but you can’t go after the IRS for additional refunds, either. If you don’t report all your income, and the unreported amount is more than 25 percent of the gross income actually shown on your return, the limitation period is six years. If you’ve claimed a loss from a worthless security, the limitation period is extended to seven years. If you file a “fraudulent” return or don’t file at all, the limitations period doesn’t apply. In fact, the IRS can go after you at any time. If you’re deciding what records you need or want to keep, you have to ask what your chances are of an audit. A tax audit is an IRS verification of items of income and deductions on your return. So you should keep records to support those items until the statute of limitations runs out. Assuming that you’ve filed on time and paid what you should, you only have to keep your tax records for three years, but some records have to be kept longer than that. Remember, the three-year rule relates to the information on your tax return. But, some of that information may relate to transactions more than three years old. Capital gains and losses. Your gain is reduced by your basis – your cost (including all commissions) plus, with mutual funds, any reinvested dividends, and capital gains. But you may have bought that stock five years ago, and you’ve been reinvesting those dividends and capital gains over the last decade. And don’t forget those stock splits. You don’t ever want to throw these records away until after you sell the securities. And then if you’re audited, you’ll have to prove those numbers. Therefore, you’ll need to keep those records for at least three years after you file the return reporting their sales. Expenses on your home. Cost records for your house and any improvements should be kept until the home is sold. It’s just good practice, even though most homeowners won’t face any tax problems. That’s because profit of less than $250,000 on your home ($500,000 on a joint return) isn’t subject to capital gains tax. If the profit is more than $250,000 ($500,000 joint filers) or if you don’t qualify for the full gain exclusion, then you’re going to need those records for another three years after that return is filed. Most homeowners probably won’t face that issue, but of course, it’s better to be safe than sorry. Business records. Business records can become a nightmare. Non-residential real property is depreciated over a period of 39 years. You could be audited on the depreciation up to three years after you file the return for the 39th year. That’s a long time to hold onto receipts, but you may need to validate those numbers. Employment, bank, and brokerage statements. Keep all your W-2s, 1099s, brokerage, and bank statements to prove income until three years after you file. And don’t even think about dumping checks, receipts, mileage logs, tax diaries, and other documentation that substantiate your expenses. Tax returns. Keep copies of your tax returns as well. You can’t rely on the IRS to actually have a copy of your old returns. As a general rule, you should keep tax records for six years. The bottom line is that you’ve got to keep those records until they can no longer affect your tax return, plus the three-year statute of limitations. Social Security records. You will need to keep some records for Social Security purposes, so check with the Social Security Administration each year to confirm that your payments have been appropriately credited. If they’re wrong, you’ll need your W-2 or copies of your Schedule C (if self-employed) to prove the right amount. Don’t dispose of those records until after you’ve validated those contributions. Contact the office by phone or email if you have any questions about which tax and financial records you need to keep this year. 1. If you received a six-month extension of time to file, you do not need to wait until the October 17, 2016, due date to file your return and reconcile your advance payments. You can–and should–file as soon as you have all the necessary documentation. 2. You must file to ensure you can continue having advance credit payments paid on your behalf in future years. If you do not file and reconcile your 2015 advance payments of the premium tax credit by the Marketplace’s fall re-enrollment period–even if you filed for an extension–you may not have your eligibility for advance payments of the PTC in 2017 determined for a period of time after you have filed your tax return with Form 8962. If you have any questions about filing an extended return, help is just a phone call away. 1. Vacation Home. A vacation home can be a house, apartment, condominium, mobile home, boat or similar property. 2. Schedule E. You usually report rental income and rental expenses on Schedule E, Supplemental Income and Loss. Your rental income may also be subject to Net Investment Income Tax. 3. Used as a Home. If the property is “used as a home,” your rental expense deduction is limited. This means your deduction for rental expenses can’t be more than the rent you received. For more information about these rules, please call. 4. Divide Expenses. If you personally use your property and also rent it to others, special rules apply. You must divide your expenses between rental use and personal use. To figure how to divide your costs, you must compare the number of days for each type of use with the total days of use. 5. Personal Use. Personal use may include use by your family. It may also include use by any other property owners or their family. Use by anyone who pays less than a fair rental price is also considered personal use. 6. Schedule A. Report deductible expenses for personal use on Schedule A, Itemized Deductions. These may include costs such as mortgage interest, property taxes, and casualty losses. 7. Rented Less than 15 Days. If the property is “used as a home” and you rent it out fewer than 15 days per year, you do not have to report the rental income. In this case, you deduct your qualified expenses on Schedule A. Please call the office if you have any questions about renting out a vacation home. 2. Annual Exclusion. Most gifts are not subject to the gift tax. For example, there is usually no tax if you make a gift to your spouse or to a charity. If you give a gift to someone else, the gift tax usually does not apply until the value of the gift exceeds the annual exclusion for the year. For 2016, the annual exclusion is $14,000 (same as 2015). 6. Gift-Splitting. In 2016, you and your spouse can give a gift up to $28,000 ($14,000 each) to a third party without making it a taxable gift. You can consider that one-half of the gift be given by you and one-half by your spouse. If you’ve ever done your bookkeeping manually, you’ve probably only allowed certain employees to see every sales form and account register and payroll stub. Most likely, you established a system that allowed staff to work only with information that related to their jobs. Even so, there may have been times when, for example, someone pulled the wrong file folder or was sent a report that he or she shouldn’t have seen. QuickBooks helps prevent this by setting virtual boundaries. You can specify which features of the software can be accessed by employees who work with your accounting data. Each employee receives a unique username and password that unlocks only the areas he or she should be visiting. 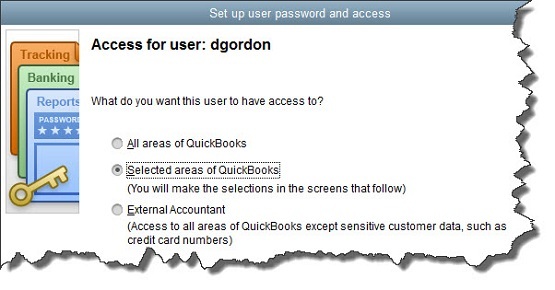 Figure 1: To help minimize errors, maintain data integrity, and preserve confidentiality, QuickBooks lets you restrict users to designated areas in the software. Here’s how you as the Administrator can define these roles. Open the Company menu and select Set Up Users and Passwords | Set Up Users. The User List window opens. You should see yourself signed up as the Admin. Click Add User and enter a User Nameand Password for the employee you’re adding. Confirm the Password and check the box in front of Add this user to my QuickBooks license. Click Next. Note: You can have as many as five people working in your QuickBooks company file at the same time, depending on how many user licenses you’ve purchased. Not sure? Press F2 and look in the upper left corner. If you need more than five user licenses, please call the office to find out about upgrading to QuickBooks Enterprise Solutions. In the next window that opens (see above screen), you’ll be given three options. Probably you’ll most often select the second option, which lets you specify the screens this user can see and what he or she can do there. The first–All areas of QuickBooks–would seldom be granted. And the third allows us to come in and do whatever tasks have been outlined in our work relationship (troubleshooting, monitoring, creating and analyzing reports, etc.). Click the button in front of Selected areas of QuickBooks and then Next. 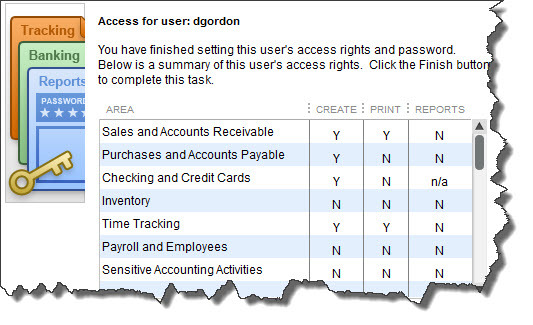 You’ll see the first in a series of screens that deal with the software’s functional areas: Sales and Accounts Receivable, Purchases and Accounts Payable, Checking and Credit Cards, Inventory, Time Tracking, Payroll and Employees, Sensitive Accounting Activities(funds transfers, online banking, etc. ), Sensitive Financial Reporting, and Changing or Deleting Transactions. Figure 2: When you give employees Selective Access in a particular area, you can further define their roles there. 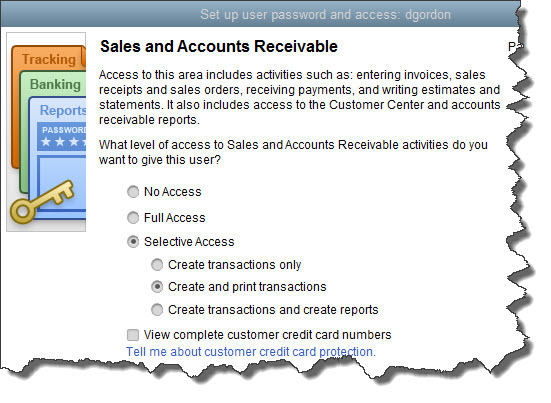 The Sales and Accounts Receivable screen is a good example. You can see the options offered in the above image. By clicking on the buttons pictured, you’re giving this employee permission to both create and print transactions. Below these options, you’ll be able to keep him or her from seeing customers’ credit card numbers in their entirety by clicking in the small box. When you’re finished, click Next. We may or may not have established and password-protected a Closing Date for your company file. This is the date when the books for a specific time frame have been “closed,” meaning that transactions should not be entered, added, or deleted prior to it. We can talk with you about the pros and cons of such an action. Here and on every other screen in this multi-step wizard, you can always click the Backbutton if you want to return to a previous window. When you’re finished, you’ll see a screen like the one in the above image that summarizes the choices you have just made. If you’re feeling any uncertainty or confusion about the whole issue of access rights, please call to discuss your options. These are important decisions. You’ll want to stress to your employees that restricting their permissions does not signal a lack of your trust in them. Rather, QuickBooks provides these tools to protect everyone who uses the software as well as any external individuals and companies that might be affected. Employees Who Work for Tips – If you received $20 or more in tips during August, report them to your employer. You can use Form 4070. Individuals – Make a payment of your 2016 estimated tax if you are not paying your income tax for the year through withholding (or will not pay in enough tax that way). Use Form 1040-ES. This is the third installment date for estimated tax in 2016. Corporations – File a 2015 calendar year income tax return (Form 1120 or 1120-A) and pay any tax due. This due date applies only if you made a timely request for an automatic 6-month extension. S corporations – File a 2015 calendar year income tax return (Form 1120S) and pay any tax due. This due date applies only if you made a timely request for an automatic 6-month extension. Provide each shareholder with a copy of Schedule K-1 (Form 1120S) or a substitute Schedule K-1. Partnerships – File a 2015 calendar year income tax return (Form 1065). This due date applies only if you were given an additional 5-month extension. Provide each shareholder with a copy of Schedule K-1 (Form 1065) or a substitute Schedule K-1. Corporations – Deposit the third installment of estimated income tax for 2016. A worksheet, Form 1120-W, is available to help you make an estimate of your tax for the year.